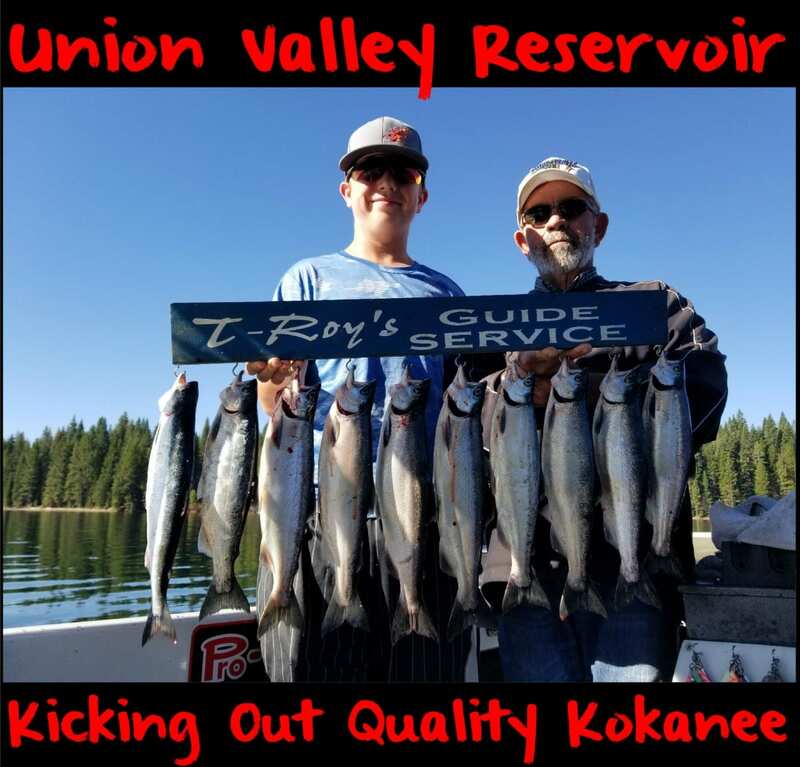 Union Valley’s kokanee fishing has been incredible summer. It’s a long ways for me to drive, but with the quality of fish this high mountain lake has been producing it’s been worth it. I wish it were closer because many of us Northern California kokanee anglers would be there all the time if it were. We are seeing kokanee to 18 inches now. We were catching kokanee from 14-17 inches early in the summer, but they’ve been growing. My buddy caught some 18-inch fish the other day and a few that almost reached 19. I don’t know if we’ll see a 20-inch fish out of there because all the years I’ve fished up there I’ve never seen one, but it’s possible with a few fish to 18 inches already showing. 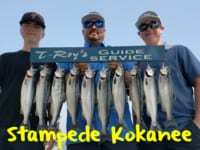 Regardless, the fishery is showing well this summer, which is exciting for us kokanee anglers considering how poor Berryessa still is. I think the kokanee bite will continue through early September. I’ve seen it go into the second or third week of September, but don’t see that happening this season particularly with some of the fish turning already. It’s been and interesting bite up there. 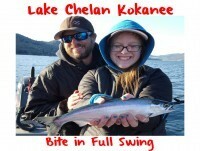 There have been two separate schools of kokanee this summer. One of them was about ready to spawn recently and the other is chrome. I’m thinking maybe there’s two strain of kokanee in the reservoir and they are simply at different points of their life cycle. There might be a Tahoe and a Stampede strain, but the difference in them is noticeable. Union Valley is roughly an hour from most in Sacramento and about two hours from where I live so it gets less pressure than the Motherlode lakes. It’s a long ways to go, but the fishing is good. I normally go during the week and most of the time there’s only a few boats up there, but we’ve seen up to 10. The weekends, however, are more crowded. Being there early is critical. You have to be there before the sun comes up. Sometimes the bite only lasts until 10am, but you’re there early to beat the water-skiers. After 10 they can shut the bite off. Last time we trolled we were on the water at 5:45 am and headed back at 8:15 with 15 fish (three limits) and lost another eight. I wish I didn’t delete my fish finder pictures of the schools of fish. It’s incredible how many kokanee there are up there. If you’re heading up plan to troll the following areas: Sunset Boat Ramp, by the dam, Camino Cove and Yellow Jacket Power House. Most recently, the kokanee were roughly 65 to 75 feet down, but that can change daily. They’ll continue to drop deeper as the season progresses. Trolling produces easy limits. Last time I ran Rocky Mountain Tackle dodgers with small Spin N Glos, micro hoochies, Radical Glow tubes and Uncle Larry’s spinners. The bite has come on pink, orange and chartreuse. We’ve been tipping everything with Red, Pink and Natural Fire Corn. Editor’s Note: Troy Barr operates T-Roy’s Guide Service. 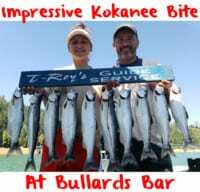 For more information on his kokanee trips please visit http://www.fisht-roys.com.